Assassin's Creed: Arena condenses the series' cat and mouse gameplay into a board game, so long as you don't mind learning some tricky rules. Cryptozoic is quickly earning a reputation for transforming popular video games into surprisingly faithful board games, and Assassin's Creed is the latest franchise to get the analog treatment. 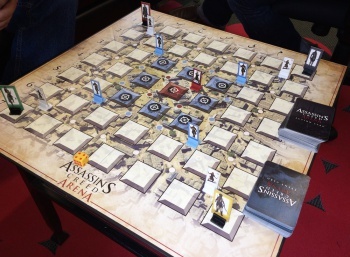 Assassin's Creed: Arena will pit two to four players against one another through a decidedly lower-tech Animus - a simple board, some game pieces, and a deck of cards. Each player takes on the mantle of a specific Templar from Assassin's Creed: Revelations. Moving across the rooftops of a cardboard Constantinople, they'll compete for kills and treasure while doing their best not to end up on the business end of a hidden blade. A few interesting twists echo the gameplay of the Assassin's Creed video games - for example, you won't be able to take out your targets if there are guards nearby, so you'll need to lure them away or hide until there's a better opportunity to strike. The board game experts at Cryptozoic Entertainment are recommending the game for players of ages 15 and up, and not just because the game is basically a medieval murderfest. The rules are a little complex, as you'll need to remember to hide from patrolling guards while hunting. Hand management is also critical, since the cards you use to move, attack, and hide also double as your hit points - overcommit to an aggressive attack, and you'll be easy pickings for the other players. Assassin's Creed: Arena can be pre-ordered from Cryptozoic now. The game is slated to hit shelves on February 26 for $50.